Visiting the Grayson Perry show, The Tomb of the Unknown Craftsman, at the British Museum earlier this year was a truly memorable experience. But there are quite a number of dramatic twists before we even got a sniff of his gorgeous motorbike! 1. Agreeing on a date that suited the whole family and buying our train tickets. 2. Several days elapsing and me forgetting to actually book the exhibition tickets. 3. Drama, tears and despair (mine) when I discovered that the British Museum had sold out of tickets for the day that we planned to visit and had bought train tickets for. But we didn’t get very far before the real drama started. Sadly someone committed suicide and used our train to do the deed. There was more drama, a very shaken but professional train driver and conductor, police, air-ambulance, police dogs and free water! Three hours later we crawled the half mile into Nuneaton and that is where our Alternative Grayson Perry Day began. Everything was seen through a lens of it being ... not the Grayson Perry exhibition. So we took in the sights of Nuneaton, a once coal mining and textile manufacturing town which is now fairly down at heel. Nuneaton Library, no comparison to the British Museum but a strange little building that still catches my interest. I used to pass it when I came to Nuneaton for hula-hooping classes! Next stop was the Museum and Art Gallery. Grayson did you know that George Elliot came from Nuneaton? How about Larry Grayson? Yes he came from Nuneaton too! This was really very entertaining. Remember 'Shut that door' ? To be honest I love these small museums. I like to be surprised. You can be sure that I will always visit a museum and art gallery in any town that I visit. And for me the less ‘done up’ it is the better. I am interested in idiosyncrasies and individuality. In this age of globalisation the small town museum must cling onto their individuality. Yes Grayson Perry would probably have found something that he liked in Nuneaton's museum and Art Gallery. In the costume gallery I felt very drawn to this chunky radiator; Plenty of curvaceous ridges and a sensual form. 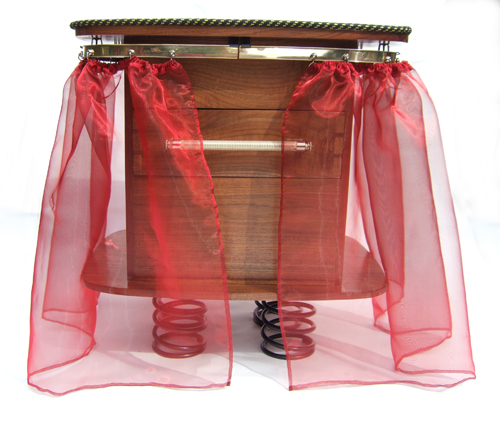 Also this dressing table of course. she was a little girl. I had the same one in my bedroom when I was little and years later I rescued it from my Dad’s shed. I salvaged the brass curtain rails from it and these rails are now part of Rachel (see next photo) a Frillip Moolog being that I completed back in 2010. A street fountain but not one worthy of anyone wishing to drink holy waters. Honestly what were these town planners thinking of when they put this here? But when we did get to actually sample the delights of The Tomb of the Unknown Craftsman a few days later it was interesting to note that my absolute favourite of Grayson’s selected items from the British Museum's collections was a small lead item (very similar to the one in the following photo). This curiously shaped item from medieval times was labelled as being a pilgrim badge. That little item stuck in my mind and days later I suddenly realised. Of course it's obvious (to me) those elbow shapes and the bulbous body remind me of the ants in the animated film, A Bug's Life. Strange I know but it's just the way that my brain works. These visual connections cannot be denied! I had reason to visit Scunthorpe a few weeks later. Yes of course I went to visit an art gallery (20:21 Visual Arts Centre ) but I was also delighted by the local museum. 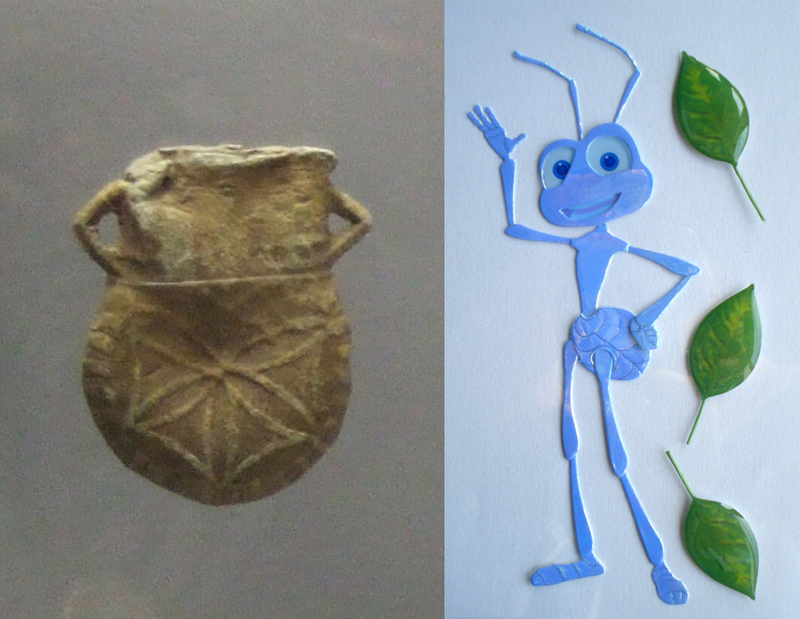 In Scunthorpe's Museum of Lincolnshire Life there is tons of fantastic stuff! They have fossils coming out of their ears, hoards of Roman coins and quite a few of these medieval lead curiosities. 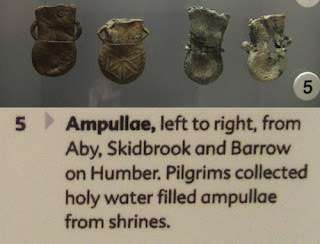 Although the label in the British Museum said that it was a pilgrim badge I’m believing the museum in Scunthorpe's label....ampullae. Yes these would have been used to carry home some holy water. Here is my Air Ambulance pencil alongside two of my other favourite pencils. You can't beat a sleek black pencil topped with a pink or green Swarovski crystal. Not quite Swarovski Crystals but fantastically fun, colourful and sparkly none the less, these coloured gems add the perfect finishing touch to the leather saddle on Grayson Perry's spectacular hand-built motorbike (Alan Measles' pope-mobile). Can you ever have too many finishing touches? The exhibition itself was very definitely worth the two attempts that it took us to get there but even having visited the exhibition in the flesh is that enough? "How is a young demi-god to get on without an online profile?" Since discovering Alan Measles' blog I have had many moments of bursting into spontaneous laughter. Here's an excerpt to whet your appetite. The chattering classes fall silent and all across Hoxton, Hampstead, Primrose Hill, dinner party guests take another unconstrained chug on the Chardonnay in a desperate attempt to cover the embarrassed silence that has hollowed out their cultural lives now that ‘it’ is over. Salads wilt and confessional writings die on uncharged I-pads across swathes of good school catchment areas. School children sit stumped, crayon in hand all enthusiasm for a drawing gone, the playground quietens, Beckham, Bono or whoever they ape in play these days no substitute for the briefly glittering shrine to a small relic of tatted foam. ‘Daddy’ they say ‘ I want to be wandering holy man when I grow up’. Alan Measles, the bear behind Grayson Perry writes rib ticklingly funny blog posts. He is wise, irreverent and far far from being pretentious. Grayson Perry the artist and Alan Measles the demi-god and blogger; what's not to like?